This weeks Local History News is dedicated to providing resources and links about the AASLH Annual Meeting. Local History News will resume its regular format next week. Checking in at the AASLH Conference this morning? Our own Julie Hillenbrand (left) is volunteering and will be there to greet you and hand you conference goodies and information. You can find her and the Registration/Information desk in the Basement of the hotel. The next small grants deadline for the Minnesota Historical & Cultural Heritage Grants program is Friday October 10, 2014. Applications must be submitted via the grants portal by midnight on the deadline date. Contact the Grants Office, 651-259-3467 or 651-259-3459, with questions. 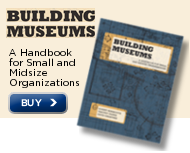 Congratulations Gen. David Hamlar, Jr.
22 Ways To Get The Most Out Of A Museum Visit. Can't make it to AASLH 2014 in St. Paul? Try Louisville next year! Try something new—Participate in Pop-Up Session at the Annual Meeting. AASLH is now accepting proposals for sessions and workshops for the 2015 Annual Meeting in Louisville. Science Museum of Minnesota, St. Paul MN, seeks Science Learning Division Operations Specialist. Deadline: September 25, 2014. The Works Museum, Bloomington MN, seeks Education Program Manager. Deadline: October 1, 2014. The Bakken Museum, Minneapolis MN, seeks an Exhibit Developer. Some changes have been made to the Annual Meeting schedule since the publication of the preliminary program guide. Cancelled sessions, new sessions and Pop-Up Sessions. Evening Event - Mill City Cooks! Location: Mill City Museum, Wednesday September 17, 2014, 6:30–9:30 p.m. Cost : $50. Garrison Keillor, is one of America’s most beloved radio hosts and acclaimed humorists. Thursday September 18, 2014, 10:45 a.m. to 12 p.m.
Marilyn Carlson Nelson, former chairman and CEO of Carlson. Friday September 19, 2014, 10:45 a.m. to 12 p.m.
Join AASLH in honoring the best in state and local history at the 2014 Leadership in History Awards. Friday, September 19, 2014, 6:30 to 9:30 p.m. Cost: $60. Dr. Anton Treuer, Executive Director of the American Indian Resource Center at Bemidji State University and author of thirteen books. The Twin Cities offer bicyclists world-class bicycling facilities and Saint Paul has over 140 miles of bike lanes, bicycle boulevards and off-street paths. Are you coming to Saint Paul and don't have a bike (or leaving yours at home)? Not to worry!